A combination of circumstances which arose at the same time as my ISP’s decision to stop providing email addresses caused the Sinclair QL Homepage site to disappear a few weeks ago. Fortunately, Graeme Gregory stepped in and quickly provided a temporary home for the site complete with downloads at the temporary new home of www.greybeardz.com until I get time to fully restore the original site. 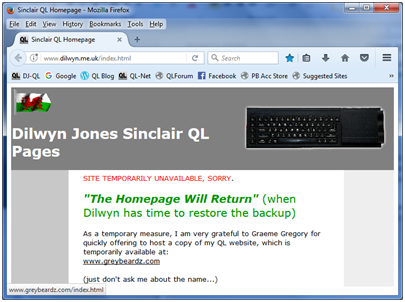 The dilwyn.me.uk site site remains available but has not yet been fully restored from backups. A temporary home page redirects you to the greybeardz.com site for now. This entry was posted in News and tagged QL Homepage on 08/06/2017 by Dilwyn.